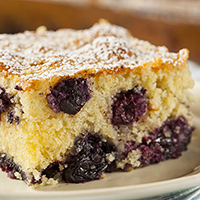 A multi-purpose cake—serve for breakfast or dessert. In a large mixing bowl, combine flour and sugar. Cut in butter or margarine by hand, or mix with an electric mixer on low speed until crumbly. Reserve 3/4 cup of the crumb mixture for topping. To the remaining mixture, add baking powder, egg yolks (reserve whites in a separate bowl), milk, and vanilla. Beat until combined, about 1 minute. Whisk the reserved egg whites until soft peaks form. Gently fold into the batter. Pour the batter into a greased 13 x 9 casserole dish. Cover with blueberries. Sprinkle reserved crumb mixture over the blueberries. Bake at 350°F for 35 to 40 minutes, until lightly browned and fully cooked.